This is a small family hotel offering furnished rooms. 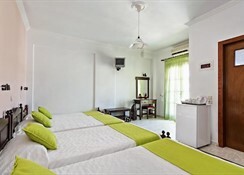 The hotel is conveniently situated at an walking distance (500 metres) from the central square of Fira the island capital. The welcoming atmosphere & reasonable prices guarantee a holiday well spent.